Engineering has been a 4-H program area since the early years of the program. Maintaining engines in farm machinery and equipment has been a valuable skill for youth to learn for many decades. In more recent years, projects like small engines and robotics have expanded engineering learning opportunities to more youth beyond the farm. The February, 1920, issue of Farm Boys’ and Girls’ Leader had a detailed article about Junior Farm Mechanics. 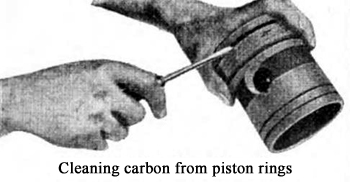 The illustrated article told how to scrape and tighten bearings, clean carbon from piston rings and grind valves to improve engine efficiency. Several decades later, a 1945, issue of National 4-H News announced the Live Power Program competition that covered the care and operation of farm tractors. Members and volunteers enrolled in the 4-H farm tractor maintenance program from 14 central and western states were eligible. County winners received a sterling silver medal. The top county winner received a $15 scholarship to attend the state Tractor Maintenance Clinic. One representative from the top state group received an expense-paid trip to National 4-H Congress in Chicago. Today there are a variety of opportunities in engineering projects at the county, state, multi-state and national levels for 4-H members in tractor, small engines, robotics and more. If you have club members or volunteers who are involved in these programs, ask them to talk about their project work. If you don’t have any members in these programs, invite a local business person to talk to your club about safe operation and maintenance of engines that your members might work with. Talk to your 4-H educator about 4-H project opportunities in engineering at the county and state levels. It could start a new project interest in your group! This entry was posted in History and tagged 4-H Mechanical Engineering by Jim Kahler. Bookmark the permalink.